Click here to hide form Click here to submit your review. 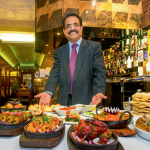 Situated in the affluent area of Aldermans Hill in Palmers Green, Dipali restaurant has been a regu-lar feature of the area. It had been over 5 years since the last time I dined at the bistro and I was intrigued to see how the cuisine had changed if at all. For starters and for two people, we started with the usual veg and meat Samosas (small but nice), Raja Chingri Butterfly prawns (delicately spiced and fried traditional) and Chotpoti (chickpea fusion). Efficiently served by friendly staff, the starters were appetizing with a boisterous taste, although limited in portion. For the mains, we opted for a combination of dishes to share. The Tandoori Mixed grill consisting of a variety of favorites including chicken, sheek kebab, lamb and chicken tikka was served with piping hot naan bread. We complimented this with house biriyani rice special, Bombay Aloo (spiced potatoes) and the traditional Tarka Dall, which provided a lovely contrast to the spice of the mixed grill. The restaurant certainly has not lost its style for cooking over the years and has maintained a strong local following. A touch on the pricey side, Dipali restaurant offers delicious tasting dishes.